Renee Montaigne did a piece this a.m. on Morning Edition on Tracey Ullman’s knitting obsession an new book. Check it out! Hey, it’s not even been a month since my last post…. Hi everyone! 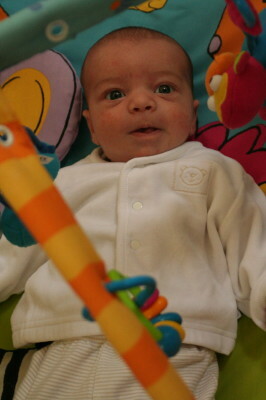 We’re still here, alive (but not sleeping much) and well. I thought I’d post the last 6 weeks worth of knitting. I’ve taught myself how to knit while nursing. Boy, did that make the time go by faster! Who knew nursing took sooooooooo much time??? 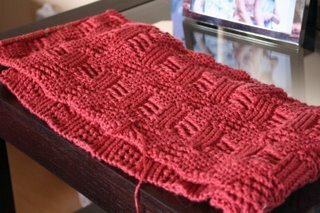 Here’s a Midwest Moonlight scarf (from Pam Allen’s Scarf Style) in Knit Picks Shine Worsted (color: Terracotta). I ran out of yarn so I’m waiting for a new KP order to come with an extra two balls. 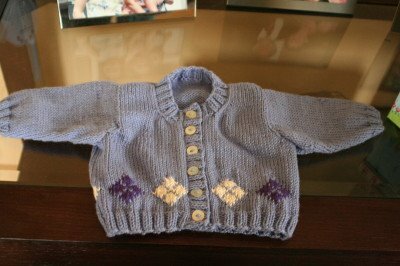 Here’s a sweater I was working on when I went into labor. It’s a good thing the intarsia was all done because I guarantee you this would never have been finished if it hadn’t been straight stockinette stitch after the argyle. Pattern from Debbie Bliss’ Special Knits in Knit Picks Shine Sport. 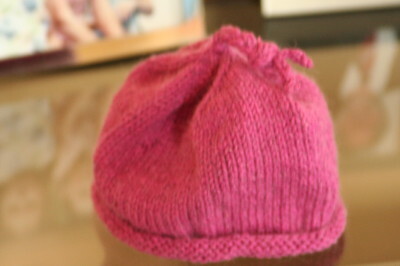 Here’s a hat I made for Beatrix just after she was born. It’s done in Rowan Cashsoft DK (I splurged) and PINK because all of her clothes are blue or yellow. Everyone thinks she’s a boy. 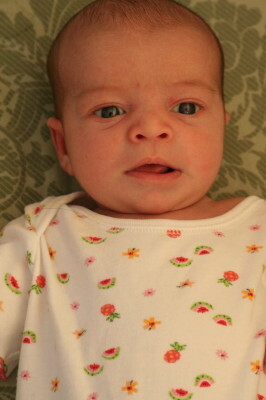 I don’t mind too much because I’m not into dressing her in pink and purple but I think one pink hat would be nice. Yeah, well speaking of gender-neutral clothes (oops), here’s the beginning of a new sleeveless dress from Debbie Bliss again. 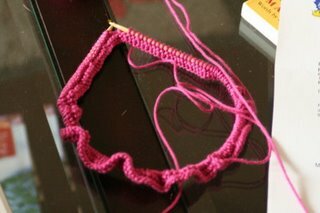 In KP Shine Worsted (orchid). The yarn for this was ordered long before Beatrix was born so shut it… 😉 And now, some gratuitous baby pictures. This is Beatrix at 4 weeks.